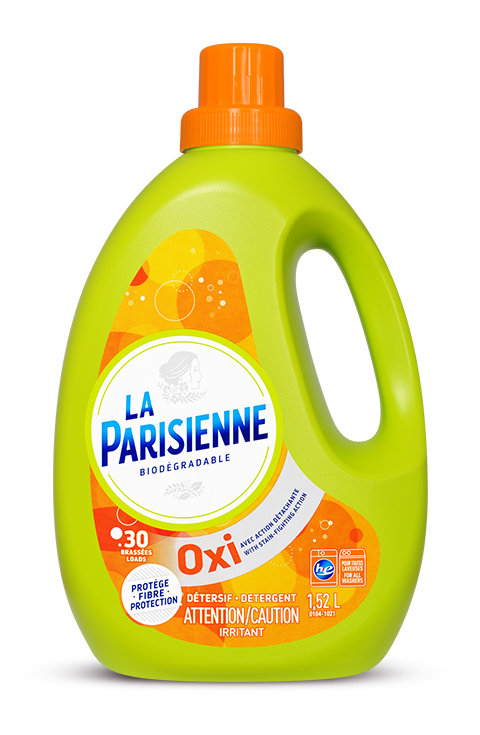 La Parisienne OXI detergent with stain-fighting action is the perfect solution to clean everyday dirt and remove stubborn stains in just one wash. Its superior cleaning power gets rid of the toughest stains. LA PARISIENNE OXI LIQUID DETERGENT IS VERY VERSATILE. IT CAN BE USED AS A REGULAR DETERGENT IN YOUR LAUNDRY, BUT ALSO AS A STAIN REMOVER WHEN PRETREATING. Remove stains as soon as possible (pretreat immediately and rinse well in cold water if you cannot wash the item right away). Quickly treating stains greatly increases your chances of removing them. Prompt action is your best friend! Always make sure stains are gone before drying your laundry. Stains are always harder to remove once they have been machine dried. If stains remain after an initial washing, soak your clothing with liquid detergent again or apply detergent directly to the stain. Rub and wash again. Use the right amount of detergent: instead of guessing, read the amounts listed on the packaging and rely on the lines inside the cap. Using too much detergent won’t make your clothes cleaner. It just causes waste. *Biodegradable within 28 days according to the OECD 301D test standards as confirmed by an independent lab.